If you are looking for a plant with impact, Telopea speciosissima with its brilliant red flowers is one to consider. Commonly called the New South Wales Waratah, it grows well in containers and makes an excellent feature plant in the garden border. The species itself has red flowers, however pink flowering varieties such as ‘Pink Passion’ and ‘Shady Lady Pink’. Telopea speciosissima ‘Wirrimbirra White’ is a naturally occurring white form. 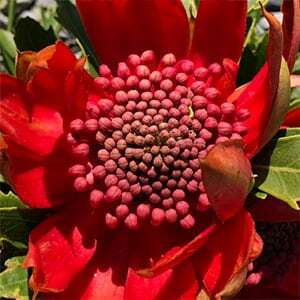 Other Waratah varieties are also available. Telopea speciosissima requires a well drained soil to thrive, it is the combination of soil and sun that determine its size as well. In really good soil, humus rich, deep and well drained, the New South Wales Waratah will reach over 4 metres. The following method of planting works well. Prepare the soil well before planting, ensure that the drainage is good. In soils without good drainage add extra material to ‘Hill Up’ the garden bed, in wet soils ‘Hill Up’ to around 30 – 40 cm. 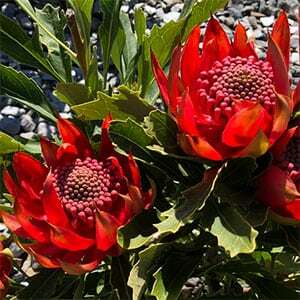 Plant the Waratah in the hilled up soil and water in well using a liquid seaweed fertiliser. Mulch around the plant to prevent weeds. Fertilise each spring and autumn using an organic native plant fertilise, or try aged cow manure and blood and bone. A position that is protected from strong winds is recommended, as is good morning sun and some protection from the heat of the afternoon sun. Imagine a 50% shade cloth in the afternoon. Give the plant room to grow, use large containers and in the garden plant at around 1 metre to 2 metres apart. Replenish the mulch each spring after fertilising. Water during any long dry periods, do not allow the soil to dry. So good drainage, good moisture. Pruning after flowering is the secrete to more flowers the following year, this practice keeps the plant smaller and with a good bushy habit. Look for a healthy bud as far down each stem as you can, and prune to this. If that seems to severe, prune back each stem by 1/2. Over time the plant will produce less flowers, however this is a plant that does have a lignotuber. This means you can prune it back to ground level and its will reshoot most times. Again do this directly after flowering. You can propagate Waratahs from cuttings, and these are taken in spring. The cuttings will strike best with some bottom heat, so heated propagating mat is recommended. An easier method of propagation is from seed, fresh seed will germinate with 3 – 4 weeks. The disadvantage is that seed grown plants will take longer to come into flower. Flowers – Red, pink yellow and white cultivars are also available.